Saturday, June 26th Will went to town in the forenoon. I was working with the chickens and got the dinner. I put out cabbage plants in the afternoon and picked over some gooseberries. Sunday June 27th 1897 I was busy with work in the kitchen all forenoon. wrote and read a little in the afternoon and entertained the family from down at Aunt Lindas home for supper. Monday June 28th 1897 The boys picked cherries for me this morning and I worked with them every moment I could spare from the regular work. We have two new men to work today. Tuesday June 29th 1897 The boys picked more cherries for me and I worked as I did yesterday to put them up. The weather is warmer. Wednesday June 30th 1897 I finished up the cherries today though it took most of the day. I have more than thirty quarts. Will was up town this morning and Ed Mc--. They are getting on with the corn plowing. 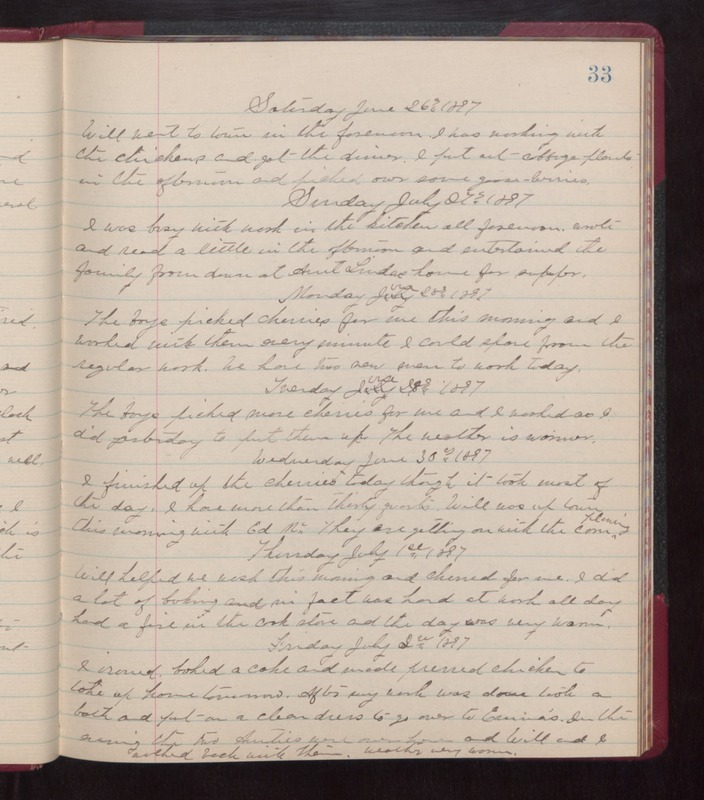 Thursday July 1st 1897 Will helped me wash this morning and churned for me. I did a lot of baking and in fact was hard at work all day. had a fire in the cook stove and the was very warm. Friday July 2nd 1897 I ironed, baked a cake, and made pressed chicken to take up home tomorrow. After my work was done took a bath and put on a clean dress to go over to Emma's. In the evening the two Aunties were over home and Will and I walked back with them. weather very warm.